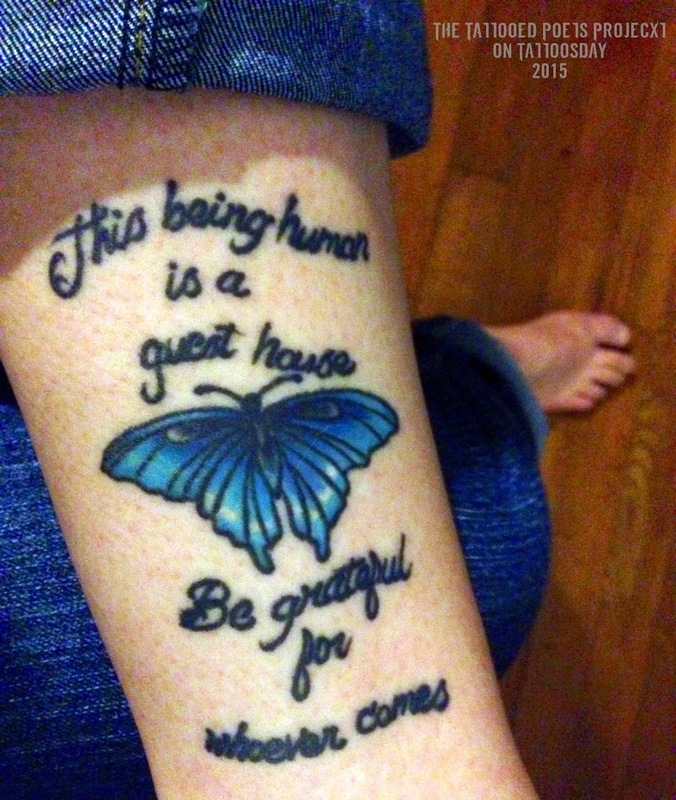 This tattoo reads, "This being human is a guest house/Be grateful for whoever comes." "My tattoo features an excerpt from the beginning and (almost) end of The Guest House [by] Rumi, translated by Coleman Barks. The text surrounds an image of a Pipevine Swallowtail butterfly. I chose the text and the image for a couple of reasons. First of all, I had the tattoo done at 13 Roses in East Atlanta Village (I forget the name of the artist, but he was wonderful and worked from a photograph of the butterfly, and I used to live in EAV) on April 27, 2013, one year after my father suddenly had a grand mal seizure (with no seizure history). He died five difficult months later from a glioblastoma (brain cancer, which caused the seizure). The butterfly in general is a symbol of transformations, of course, and I had always loved finding butterflies with my father, especially the gorgeous blue Pipevine Swallowtail, which is native to Georgia (as am I). The text also speaks of transformations and is a reminder to be grateful for *all* life brings (the end of the poem continues 'because each has been sent / as a guide from beyond'). The text was already incredibly important to me for coping with CRPS (complex regional pain syndrome), a debilitating chronic pain condition (we're talking wind blowing feels like fire) I developed after an electrical injury in 2003. In fact, I lost the ability to physically write, but I learned to use a voice program in order to keep writing my poetry (which had the interesting and even helpful effect of tuning me more into the sound/music). I memorized the Rumi poem, which I already loved, at the suggestion of one of my beloveds (Rumi, of course, often refers to the Beloved), and I repeat it often, in wonderful and in difficult times. This past summer, the poem helped me through after they drilled into my spine and cut skin away from muscle as I had an intrathecal pump implanted (basically a hockey-puck-like chunk of titanium in my abdomen filled with Prialt, medication derived from synthetic sea snail venom, that gets pumped into my spinal fluid). This medication is both amazing and insane, and as we continue to search for my perfect dose, I have lost and regained the ability to walk, and sound/light/movement are all pain-inducing and nauseating, among other crazy side effects, but the CRPS is more well-controlled than ever before. 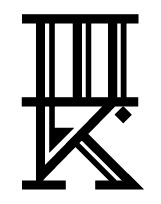 Again, this tattoo as well as the poem and ideas about transformation it evokes keep helping me through. I call upon the poem in times of joy as well, such as when I finally legally (at the federal level – still fighting for it in Georgia) wed my talented and beautiful wife in San Francisco in the summer of 2013. I'm quite happy with the tattoo (the color and shading of the butterfly is particularly stunning), which is a good thing, as I can't get any more. My CRPS was originally in my right arm and hadn't spread beyond it in over ten years, but three months after getting the tattoo, it spread to my left leg (where the tattoo is). Three months is quite awhile so it could be coincidental, as CRPS often eventually spreads on its own, but I found out later that tattoos could possibly cause spreading, so we have to play it safe. Since I can only be inked once, I'm glad I started with Rumi." "a poem related to the situation with [her] father" and the other has to do with her CRPS. Jessica notes that "both have to do with the tattoo." but you, stubborn man, wouldn’t go. you slay me, and still I praise. until they had to strap your wrists to the bedrail. I know you tried to say death can’t hold me. into my eyes, who are you? was buried without ceremony, without last words. and then you said it, Jessica, you said, Jessica. to first words: yes, Daddy, Jessica. I couldn’t carry you back with me, though. from language, from our faces. and some days neither of us can be sure. into four different people, now. Jane said, her parents said, the preacher said, stop it. even when she got a water wife. She was an act of God. Health Insurance said talk to Fire Insurance. Fire Insurance said talk to Health Insurance. between the breathing, the stopped. Jessica Melilli-Hand is forthcoming in Hunger Mountain and is published in Painted Bride Quarterly, Barrow Street, and The Minnesota Review, among others. She won first place in the Agnes Scott Poetry Competition in 2014, judged by Terrance Hayes, in 2011, judged by Arda Collins, and in 2008, judged by Martín Espada. 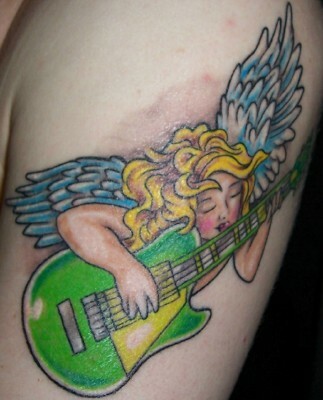 Thanks to Jessica for sharing her tattoo and poems with us here on The Tattooed Poets Project on Tattoosday!